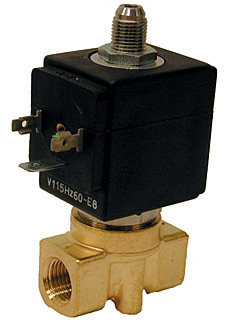 The SV4100 and SV4300 Series are direct acting solenoid valves. The valves have a brass body with brass and stainless steel wetted parts and a FKM seal material. A temperature range of -10 to 137°C (14 to 280°F) makes this valve ideal for neutral media such as compressed air, inert gas, water and synthetic oils. A strain-relief connector is supplied with each unit. A ½" conduit plug is also available. 注: * Maximum Operating Pressure Differential. Pipe sizes expressed include BSP Connection. In most cases BSP and NPT are interchangeable in this size. Comes complete with operator's manual and cable grip connector.